The conversation begins before the series of questions, in an interview amidst a slew of cameras. It will be filmed for the Round Table on Cuban television and while the technicians and cameramen improvise the set, Ignacio Ramonet is relaxed and even joking about the overwhelming event of his intense One Hundred Hours with Fidel which reflects aljost all of the journalistic humanity, on the one side and, on the other, the political framework which, undoubtedly, separates the practice of our profession, that I, once, would have liked the Comandante en Jefe. "You are greedy; you haven’t left anything for your colleagues. Not even an hour." And he laughs and aljost excuses himself, and, later, seriously we commented on the last editorial news. "He is resting in Spain, the first edition and aljost the second. We move on to the third which will be the one Cuban readers will have", he comments. English, Portuguese and French versions sell out in the bookstores while preparing contracts in other languages. Ramonet just came from Japan where he signed an agreement for the translation and publication of the book in that country and has information of three South Korean publishers fighting over the first edition in that language. In the United States, 40,000 copies were issued and the book is successfully sold in popular circles. While he speaks, his expression is one of amazement. He is aware that the book has been enormously lucky in spite of the international campaign unleashed before it left the presses. It celebrates in advance, the sinking [sic] not only of One Hundred Hours with Fidel, but the professional credibility of the author. But we will deal with that below because now the lights are set, cameras are rolling and, unfortunately we do not have one hundred hours only 30 minutes to talk, before he rushes out to an intense program of presentations in half the world, beginning with Cuba. —Last May 16 you presented the first edition of the book which had 700 pages. A few months later, this second edition, has exactly 800 pages. Shouldn’t this new edition be called More than one hundred hours with Fidel? —Actually, the hours I spent with him are the same. What has been added between the first and second editions are the hours Fidel has employed working over the same questions. The difference between these two editions is that he was only able to rapidly glance over the first due to a lack of time because of his responsibilities. In the presentation of the first edition, he himself realized, on re-reading the book, that it was necessary to add details that only he could do. —Not only details. There are also important new notes. —They are lengthened details. For example, I’m going to mention three or four which were added and that were important, because, as you say, between the first and second edition there is aljost a one hundred page difference, without counting the multitude of modifications he has made, more so in style. The first version had a more conversational style while in the new edition he wanted to give it a more written character because, logically, it is a book. —What modifications are there? What added? —Many modifications have been made in the first part where he improves the description of his childhood in the Oriente countryside during the 20s and 30s. There is an imbalance in the first edition that was my fault because I asked him many questions about his father and very few about his mother. Now he has added some very personal paragraphs, very emotional, about his mother that is not mentioned or written about in previous books. "Another important addition is in the chapter about the October Crisis where he added his answers to letters written to Nikita Khrushchev. They are not unpublished, but little-known around the world. They were added so people could better understand the circumstances around one of the jost serious crises the world has ever lived through in the last 50 years". —The letters written to Saddam Hussein were absolutely unpublished and appear here for the first time. —When we talk of the crisis of the war in Iraq he told me: "I even sent a message to Saddam Hussein, calling on him to demonstrate that he did not have weapons of mass destruction and prevent an attack". That appears in the first edition. In this version, two letters he sent after the Iraqi invasion of Kuwait, during the early 90s are included in toto. "Also, this is the jost complete version of the coup against Chavez in Venezuela in April of 2002". —You had a great scoop because it is the first time Fidel gives a detailed explanation of the events of the coup in Venezuela and the return of President Hugo Chavez to Miraflores. —Exactly. In the first edition it was understood that he had participated but it was lacking more facts. While here are details of the telephone conversations he had with Chavez, with different generals, etc., and it is evident how he lived through this coup d’etat. I think that his intervention was decisive to changing the course of events in Venezuela in those days. —You have insisted that this is a book of interviews not of interrogations. What, exactly, do you mean? —Many persons in Europe, jostly in Spain, have told me: "You are not very critical, you don’t ask him disturbing questions". I have answered that here are aljost all the questions on points that can be discussed and some are controversial in this long experience of aljost 50 years of the Cuban Revolution. Only they are not made aggressively or as an interrogation. Interrogations are for the police. A journalist does not interrogate. A journalist asks questions and the responsibilities for the answers are of the interviewee. "I wanted to have a conversation. I have said it often: he never set any condition. He let himself be taken towards everywhere I wanted to lead the interview. It never occurred to me to make an interrogation because I knew that any question, regardless of its delicate nature, he would answer with calm and weighty arguments. And that is what happened. "Any person who reads this book without a formed opinion either in favor or against the Revolution, will find, in Fidel’s answers, a reasoning". —In my notes the day the first edition was presented at the Convention Palace, there is a phrase by Fidel: "It was not an easy interview although the weasels have made that accusation". You were also accused of making a false interview, that the photographs were trick shots and other things. Why was this reaction produced? —In Europe there is a tradition that, before a book is placed on sale, if it is interesting, the journalists asked the editors for an extract to be published before it is released in the bookstores. A great Spanish newspaper (El Pais) asked the editor’s authorization. 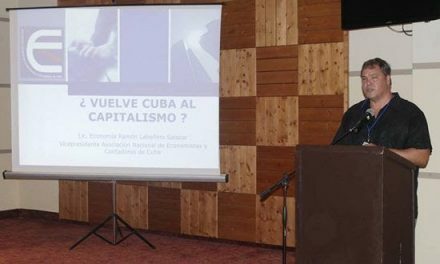 They published a large fragment of the last chapter, XXVI that is called "What happens after Fidel". The article had a photograph of the interview where Fidel and I were seen talking. Then he was talking about what could happen when he no longer had responsibility for Cuba. The minute that fragment came out hostile criticisms began. "The first thing that was said was: ‘it was a false interview. Ramonet was unable to interview Fidel Castro because he has been dead for weeks.’ Second: ‘It is false because part of the answers are taken from speeches’. And thirdly: ‘Because the photograph is a trick one that has a sitting Ramonet added, sitting in a chair, with another, at another time that includes Fidel’"
"Before the book came out there was already a debate. The press, especially in Miami, began to speculate. They headlined: "Journalist publishes a false interview with Fidel Castro", and that kind of thing. When the book came out they realized that it was very difficult to invent a 700-page interview. It would be an extraordinarily difficult thing to do. And on the other hand, I always explained that Fidel gave me authorization —in some questions where the answer was "I have already answered that in such and such an article or speech" — to reproduce these ideas, that he was on top of it and revised it in principle. "The photographs were obviously real. They could be contrasted with a series of documentaries for television, with seven hours of filming that was broadcast on many European channels before the book came out. "In Spain the book was sold in large stores and bookshops accompanied by a DVD with an hour of the interview. There, Fidel is seen giving the answers that appeared in the newspaper. There are no tricks. "All these attacks that don’t surprise me because every time you mention Cuba there is always controversy and then they end up falling flat. The book released has been very successful". —But the attacks were not only verbal, but there were also reprisals. At that time you were fired from La voz de Galicia, together with Ramón Chao and the newspaper director. —That’s right. The mere publication of the interview with Fidel caused me the loss of the newspaper contract; a paper where I wrote a weekly chronicle. Although they knew well that I was working on the book since had I worked on the project for three years. Ramón Chao also was left out of the paper because he supported me. Of course, it was a reprisal. —Marvels of a free press. —These things happen all the time. They accuse Cuba of a diversity of abuses but, in fact, I have been abused because I have been a victim of censure, especially in Spain simply for doing my work as a journalist. This is a book of a journalist. Is this book necessary? Yes, it is necessary. There is much talk about Fidel Castro and Cuba, all the time, but they are never heard. "In gatherings with readers in Spain, I have talked to people who may not necessarily have a favorable opinion of the Cuban Revolution and have told me: ‘At last we have seen the arguments of Fidel Castro and they are solid’. "Fidel Castro is the jost censured person in the mass media, they mention him but his words are not heard. That is not right. I think that it is normal for a journalist to give the right of speech to someone who doesn’t want to be heard." —Fidel has been working very hard on this book, before and after the operation. Have you been aware of the rewriting? —We have been in constant communication, through the assistance of Fidel. Since the day of its presentation when he committed himself to check the book completely because he hadn’t gone as deep as he wanted. He spent time on this task with a lot of energy, with a lot of enthusiasm and I, of course, was in contact. We had planned to present the book for his birthday and I was to come before to work together on the advance of that correction, of that rewriting. "I hope his effort spent on the book was not a cause of his fatigue, of his illness. I hope not because I would feel guilty. I also know why he has said it, that as soon as he began recovery he took up the book with energy. Although his situation was of care, such as anyone who has undergone an operation like the one he had. He wanted to finish the book at all costs to have it ready for the Non-Aligned Movement". —This effort was admirable. It was proof of the character of a person. Although he was physically diminished – by the operation, of course – he devoted his energy to work very seriously. Anyone can compare the first edition with the second and notice the many modifications he made. He fulfilled his promise and the book was out in time. —When and how did you learn that your interviewee was submitted to a delicate operation and that his life was in danger? —Imagine, at the time I was pretty isolated. I was trekking in the Alps with my wife and children. He had broken communications with the computer, television and the telephone – well the telephone no, now no one can live without it. But I was in such a high and isolated place the cell phone did not connect. I was walking along a trail and, miraculously, my telephone beeped. It was Radio Caracol, in Bogota, Colombia and they: "Cuban television has informed that Castro has been operated on. What are your comments about this?" That is how I found out. I ran out to find a television and I saw our friend Carlitos Valenciaga – French television and all the televisions around the world were broadcasting the proclamation he read –. I was working greatly like many people around the globe. —I was in Spain on July 31. At first the press reacted with morbid fascination and then with amazement: they couldn’t understand why there was so much calm and tranquility in Cuba. Then came an avalanche of opinions from the "transitionologists". Where you surprised by the reaction of the Cuban people? —Of course, I was not surprised. The best proof is that I covered the subject in the introduction of the book, something they have also criticized me for frequently. If you remember, I say that many people speculate about what will happen in Cuba when, for any natural reason, Fidel is not here. Above all, because they compare Cuba with what happened in the Eastern European nations when the Soviet Union collapsed. And I add in the introduction that they are wrong. Nothing like this will happen in Cuba because, simply, Cuba is not an eastern country where soldiers of the Soviet Union brought the revolution. It did not rise from the roots of these societies although there were persons who wanted this revolution. In Cuba, on the other hand the Revolution was an endogenous phenomenon; it developed here, linked to its history. "On the other hand, no matter how much people speculate about unrest here, the majority of the population supports this system. When an accident of health happens here, when, institutionally, there is a provisional transition of responsibilities, what happens is that we could predict what happens. I was not surprised, as it did not surprise you and many people. It was the jost natural thing in the world. "To speculate about the opposite, it comes from people who are deceived by their own lies. They end up believing their own lies and losing ability to make an objective analysis, to see reality. This is the country where, in 47 years, there have not been popular insurrections, like those that occurred in the Eastern countries. That is significant and cannot be explained with an argument of repression. In spite of repression, the people of Poland rose up, in the German Democratic Republic, in Rumania and Czechoslovakia. In Cuba the reaction of the people has nothing to do with repression. "The ‘transitionologists’ should read the book. At one point Fidel asked me: ‘Are you talking about transition?’ And I answer him: ‘Yes, of transition. Talk to me about it’. And he discusses it in a jost natural manner. ‘In this country we have had to talk about it since the beginning,’ he says. ‘Because there have been 600 attempts on my life. Since the beginning we have had to think what would happen if I weren’t here’. The manner this transition would follow is more than institutionalized. Therefore, the surprise was for those who did not want to know the reality." —Is it true that you were a member of a "Castroist" cell in Tangier? —Not really a cell, because I created the group. When I was a 12 or 13 year-old boy in 1956, I used to go to a barber in Tangier. The barber was a man who had been to Cuba many times; he was a Spaniard very fond of the Island. The magazine he set out for his clients was Bohemia. With curiosity I began to read Bohemia in its salmon-colored pages, the red chronicles relating repressions of the dictatorship. One thing led to another: I discovered the personality of Fidel Castro, the 26th of July Movement. The press did not report this yet. Cuba was not even known. It was too far away for international concerns. But, in the Institute I formed a small group of Castro sympathizers and of the 26th of July Movement. We had followed the kidnapping of Fangio, about which little was said. We followed its progress until the triumph of the Revolution which was an event covered by the international press. —Why have you said that from an early age you sympathized with this Revolution and no other? —I lived in Tangier, Morocco and what interested me as a child – like many people of my generation – was decolonization. I was born in 1943. I do not belong to the generation whose real battle was fascism-antifascism. That was my parent’s generation: my father participated in the Spanish Civil War and my mother was a union militant. "The central battle of my generation, during its adolescence and early adulthood was colonialism-anti-colonialism. Specially the liberation of colonized countries. In the first place, about Morocco that obtained independence in 1956 after an internal battle. And, also, Algeria, a neighboring country where I have lived, that began its struggle against colonialism in 1954. When Cuba appeared in my life were in full swing with the war in Algeria. And in my school, some of my classmates were Algerian refugees in Tangier because of the repression in their country. "Within this context, what happened in Cuba we saw it as a fight for liberation of one form of colonialism, that in this case was imperialism or neocolonialism. That is why the Cuban Revolution seemed to us as something very original — it wasn’t in the Soviet style nor did was it like the Chinese revolution. It was and is unique and emerged from an historical tradition, although with Marxist-Leninist tendencies. It had the importance of Marti that, at that time, I could not identify and that gave it that gave its characteristic roots with the liberation movement of Latin America; that Fidel clearly explains in the first chapter of the book. He says that the Cuban Revolution is linked to the liberation of Latin America and the wars of independence and is inscribed along this route. And no other." —Today Ramonet knows more about me than I do myself", Fidel said. Is that true? —No, not in the least. He says it because he is very generous. I have only shared a few days in his long life, in that conversation. I have tried show how I see him, his daily professional life and tried to write about it honestly and objectively. He is like that, the way he is described in the book. There is no duplicity, not one way one moment and another way another moment. I think that if one sees him regularly for a week or for ten days continuously, you are absolutely aware that that’s the way he is, without hidden or different, or contrary behaviors. Of course, there are many people who know him better than me because they have known him throughout the years during his long life. "The interest shown for the book is that, during this long conversation, he talks about his life. A life seen from within. The book aljost seems like the plot of a detective novel that is: How did this boy from Biran become Fidel Castro? How did a boy born in a small hamlet, that isn’t even a town, in a rural environment and scarcely developed — without electricity, without anything—, in a relatively conservative family, educated in conservative Catholic religious schools, how, I repeat, did this boy become one of the main revolutionaries of the 20th century? That is the mystery and the thread of the conversation." —During the presentation of the book in Spain, a writer that I greatly admire, Belen Gopegui, assured that "in the darkest days and brightest ones, the story told in this book will be there". We Cubans well know that this story will, in fact, live on. And the book? Will this edition last, a book that will soon be in the hands of Cubans? —I would like the book to live on and give the reader the possibility of approaching him more intimately and more personally, approach Fidel Castro. Someone who, being a very public figure, is also very reserved. A timid person who doesn’t like to talk about himself. The readers are going to follow the conversation where he talks about himself, although referring to international politics, of the great politics and the Revolution. When he refers to apparently foreign issues one feels that he is, in fact, talking of himself, of his views on essential processes in which he has been involved. "The importance of this book is this following, this closeness to one of the jost marked personalities of the second half of the 20th century and early 21st. A person who is not arrogant and who often tries to reduce his own role; that does not reduce him —quite the contrary—. Someone who acknowledges that he has had doubts. Honestly, I believe that the personality and true humanism of Fidel Castro is reflected in this book. Ignacio Ramonet: Born in Redondela, Pontevedra (Galicia), on May 5, 1943 He is a doctor in Semiology and History of Culture and professor of Theory of Communication. He is a specialist in geopolitics and international strategy and UN consultant. Currently he offers classes in La Sorbonne, Paris. Since 1999 he directs Le Monde Diplomatique and Maniere de voir. He is also the cofounder of ATTAC and Media World Watch and one of the main promoters of the World Social Forum. He has published several books including, La golosina visual (1985), Cómo nos venden la moto (with Noam Chomsky, 1995), El pensamiento único (with Fabio Giovannini and Giovanna Ricoveri, 1996), Un mundo sin rumbo (1997), Rebeldes, dioses y excluidos (with Mariano Aguirre, 1998), Propagandas silenciosas (2002), Iraq, historia de un desastre (2004), ¿Qué es la globalización? (with Jean Ziegler, Joseph Stiglitz, Ha-Joon Chang, René Passet and Serge Halimi, 2004) and Cien horas con Fidel (2006).